Neil, THAT is all I was asking for! I really did not paraphrase but derived from your Mondeo analogy what I thought you implied...Nothing to criticise now at all! That really is smoke - A AUD$1.2M machine has no place in this debate but..if EMCO thought my lathe needed such attention, then no doubt such a team would have been sent in the first place. My eventual choice of this lathe was based on use and track record - there are a number of such lathes in educational institutions in South Africa and I went to see some while researching. 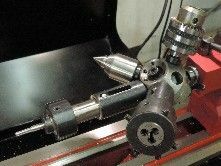 My delivery experience mirrored theirs, so my lathe was not in any 'sweet spot' - simply a good machine made to a standard.. I would suggest it is obvious that the bigger the machine the more setup required - weight, length of beds, CofG etc all have far greater effect on levels, twist and such like. The floor preparation also begins to play a larger role - If people are insinuating that my lathe does not fall withing the bounds of a hobby lathe, then your mill is certainly way out! Have you really looked at Hardinge prices lately? A TFB-H with VERIFIED conformance to spec advertises typically from US$5500 to US$9500, with a few outliers. An HLV-H reconditioned but unverified from USD$8000, up to US$33000 for a verified machine. The latter topping my 14D price by a more than a third...And yet is seems you might get an acceptable one for half the price of my lathe? A new CYCLEMATIC - the Eastern Hardinge copy - goes for $47K in the US. I know the TFB and HLV are not the typical hobby machines, and yet many hobbyist's have one.. I think the key is that what makes the hobby your hobby is different for everyone. Circumstances may allow spending more on a machine for perhaps ( note, perhaps..) better performance, or enjoyment of the machines use, some enjoy the hobby for its use of machines, for some the machine remains a means to an end only and the less time spent on the machine the better, so money is better spent where it serves best then, etc, etc. Don't judge and begrudge people their personal hobby choices, direction or particular financial circumstances - That way shows only disdain or jealousy! Neil - is there a way to remove all this clap-trap from Ian's thread - maybe another thread if you do not wish to just delete the stuff not relevant to Ian's original query intent? It has contaminated Ian's thread excessively I think..
As the encomat 14d has a maximum chuck size of 5 1/2" and a maximum faceplate also of 5 1/2" I would find it rather limiting! Not a particular useful lathe for many model engineering tasks. ... if it's more convenient than posting here, could you please eMail them to me. In the case of Wabeco they clearly state production in Germany on state - of - the - art - machine tools. There logo also states Made in Germany. The 14D chuck size is not a maximum of 5-1/2 inch at all - the standard chuck you can opt to take with the machine is 5-1/2 inch, but thats your choice - It is not a cheesy chuck though - steel body and can run at 5000RPM - since the 14D can run at 4000RPM, thats a good thing. And the Faceplate, or Mounting plate - 254mm, cast. These chucks are comparable to or even bigger than the chucks supplied with, or even as options on the C4, the Warco WM280 and even the Warco WM290, which has great center height and between centres than the 14D. The faceplate you mention of 'only' 5-1/2 inch is the precision faceplate - a cross between a 4 jaw chuck and a versatile backplate - all steel..and can run at 3000RPM. I do small but fairly high accuracy work, so RPM is important to me, and the time saved with the machine's accuracy, instead of perpetual faffing to re-center, etc is worth all the money the machine cost. As I said, people get their hobby kicks there own way, and my lathe helps give me mine! 5 1/2" doesn't sound like a small chuck to me. Most model engineers get by with a 4". I think it is just the wording on Emco's site that may put people off when they see the small sizes listed as you could easily think it won't swing larger. 100mm 3-jaw is about right on a 200mm swing machine coupled with a 150-160 lightweight 4-jaw and is what I used to run on my Emcomat 8.6. Now I have the larger WM280 which is the same size as Joseph's I have 125mm 3-jaw and 5C, a lightweight/slim 160 4-jaw and 254mm faceplate. The one reason you may want to go up a chuck size is to make the most of a big bore spindle as the larger chuck will also have a larger through hole. I don't think EMCO throws anything in for nothing...! No steady, fixed or travelling, although I did purchase both, if only for completeness. I have both for the Maximat V10, and have only ever used the fixed steady once in nearly 40 years! The sizes shown in the 14D brochure are the standard ones supplied with the machine - They will retain those and offset the cost against other approved choices. All those chucks were a significant part of the 18K EURO - nearly 7K. So the Lathe price is actually a lot less..
Posted by Joseph Noci 1 on 16/11/2018 14:56:20:. Is this a turret with multiple ER chucks? Can you perhaps point to or post a photo of this interesting-sounding accessory? I would have thought that could be done with any turret that has parallel tooling holes, just cut down some plain shank ER collets to the right length and away you go. I wouldn't worry about promoting Vero, unless you are also worried about plugging Emco, Rohm and Bison as well! Many thanks. I note in the second photo that you have rotated the turret body away from the operator. I am always looking for ways to reduce tool projection on my own device, hence my interest. Finally got around to having a look at an SC4 today. Could not really find fault in it, but it was not the step up in size that I was expecting from the SC3. Not as much metal on the compound slide as I had hoped for. I think I need something a little bigger so back to looking at Warco, and the Warco 250V. Unfortunately it is a 176 mile journey to Warco to see one. Is there anyone in Staffordshire/Shropshire area using one, willing to would let me have a look at it, and share their views and experiences? The contingency play is to search out decent metric AUD/BUD but that is proving harder than I had expected. Another one to look out for may be the Viceroy. A mate who works in a school says they got rid of two of them some years back and they showed little sign of any hard use. The Viceroy is 54" long. I don't think I could fit one in. I am very restricted in my choice by the space I have available. Perhaps revisit your original idea in your first post and think about a Boxford? A low mileage example would be a good machine. Perhaps get some help via the forum with finding or inspecting a good example? Or one from a dealer with some kind of guarantee or warranty? I know the Australian equivalent South Bend clone, the Hercus, is a very good machine, having used them over the years at various jobs and tech college etc. They are good and solid. Sort of the next size up from a Myford. Also a good used Raglan would be worth looking into as well. The Raglan is one on my shortlist. What appeared to be a good example came up on ebay a few weeks ago and not too far from me. Unfortunately the seller would not let me go and look at it before the bidding ended. It may have been a good lathe, but I wasn't going to risk it.